After months of leaks and unofficial drafts, on May 6, 2015 the European Commission finally adopted the Digital Single Market (“DSM”) Strategy: a document of paramount importance for the digital developments of the markets and societies of the EU Members States which will keep busy lots of people in Brussels for the next 5 years. Expectations and the ambitions are great, no doubt. However, since – for a matter of life – there is frequently some distance between official declarations, one one side, and concrete actions, one the other, one would wonder what and when something concrete will realistically happen. The DSM strategy of the European Commission aims at creating a single digital market in the EU without internal frontiers and segmentations. For example, it is envisaged to abolish artificial barriers (eg. by prohibiting geoblocking tools); to harmonize relevant national regulations (eg. in the matter of consumers protection and spectrum allocation ): to encourage operators to spread in and invest everywhere in the EU (eg. by rolling out broadband and high-speed networks); to regulate activities which are very relevant for digital rights and businesses but completely escaped regulation until now (eg. online platforms such as search engines, social networks and e-commerce). A list of 16 areas of actions has been tabled in order to achieve these objectives, covering various areas including copyright, electronic commerce, consumers protection, telecom regulation ecc. It is a strategic document: the priorities indicated by the Commission will be followed by the competent commissioners for specific actions. However, apart from the strong political endorsement, the destiny of the single actions is to time unpredictable. The concerned directorates general of the European Commission (mainly DG Connect, but not only) will have to carry out analyses and studies, launch public consultations, interact with stakeholders and table relevant proposals. The specific proposals may be legislative or non legislative: in the former case (most of the cases, I believe) the European Commission will have to involve European Parliament and the Council in the legislative process. This means that the entire procedure (from public consultation up to the final approval) may take 3 year or more. It’s a long way for each item then. While the need to achieve a digital single market is shared by everybody within the Commission, one should be aware that views amongst competent commissioners may be contrasting as to the concrete initiatives to be taken and the details thereof. In fact, the decision making process within the European Commission provides that there must be a majority of commissioners to approve decision, irrespective of the commissioner having competence for that. In addition, the shared competences between vice-presidents and commissioners, introduced by the new Junker Commission, will increase the likelihood of disagreements and internal conflicts. To make few examples, in the area of telecom regulation, the position of DG COMP (headed by Vestager, Denmark) appears concerned about the need to preserve effective competition within the EU, while DG Connect (leaded by Oettinger, Germany) is much more relaxed and willing to deregulate as much as possible. In the area of copyright, contrasts may emerge between Vestager and Ansip (the Vicepresident for Digital Single Market, Estonian) on one side, and Oettinger on the other, because the formers are much more convinced that the current copyright framework needs to be modernized and legacy positions must be specifically addressed: the first clear area of disagreement seems to be geo-blocking, with Oettinger more inclined to justify this instrument in some cases on the basis of consideration of culture and linguistical differentiations. Disagreements are also visible in the areas of how to tackle piracy and illegal content in the Internet, whether and to which extent a review of the current directives (Directive 2004/48 on IPR enforcement, Directive 2001/29 on copyright and Directive 2000/31 on electronic commerce) will be necessary, or whether less-intrusive initiatives will be sufficient. 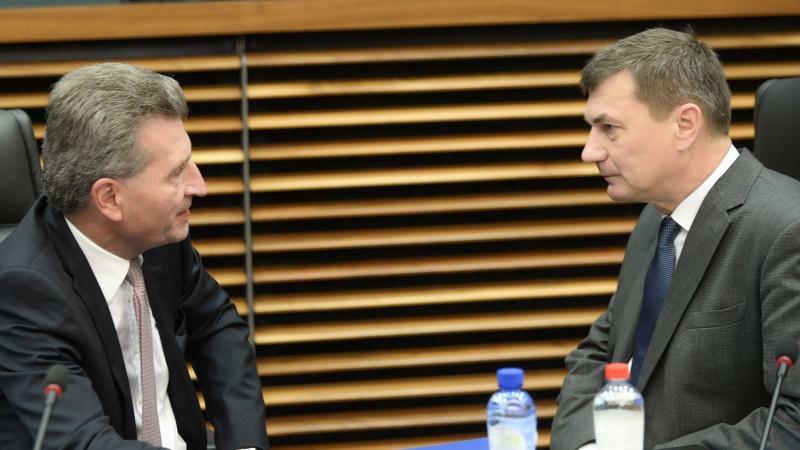 Also there VP Ansip seems to be more clearly in favor of a modernization of the entire copyright system rather than just focussing on enforcement, while the actual position of Oettinger is still debated. Oettinger is also reported to be very militant against large online platforms such as Google, while other commissioners may be more cautious as far as new regulations will impact also over European emerging platforms and start-ups. Considering all the above potential disagreements between commissioners, a pivotal role will be carried out by the president Junker, his cabinet and the Secretariat General, in view to find compromises. One should also consider the connection with the pending STM (Single Telecom Market). The proposal launched by Kroes in September 2013 is now been dealt by the Council and the Parliament, and a final approval may occur at the end of 2015. The STM regulation has been narrowed to just roaming and net neutrality, two areas which are however fundamental for the establishment of a single digital market. Therefore, the eyes of the Commission will continue to closely follow this dossier. However, the (unlikely) collapse or delay of the STM will not block the DSM, it will just cause some delay and difficulties to the DSM initiatives relating to telecom regulation. You can find the explanatory PR of the Commission here. And the strategy here. ← Europe: no continent for small and agile operators?